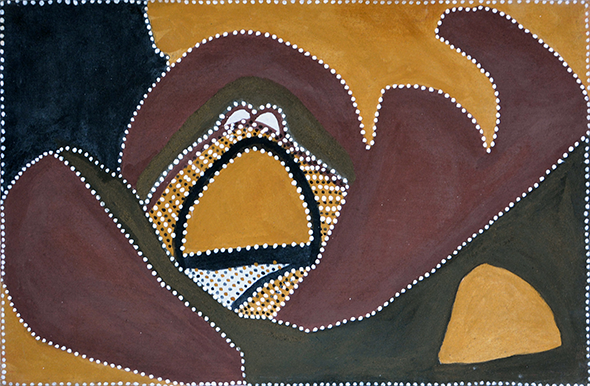 Ochres used in Aboriginal paintings were traditionally mined or dug from areas with a type of colourful soft stone. There are many such sites across much of Australia but some of the most impressive are the Ochre Pits in northern South Australia, and in the Breakaway Mountains not far from there. The colours are a range of browns, reds, sandy yellows, whites, greys, moody purples, and even greens. Aboriginal people would sometimes travel quite a distance to get the best ochres for ceremonial uses. Indeed western cultures too grind down these same ochre pigments to manufacture the quality earth colours in oil and acrylic paints. Where Indigenous Australians mixed ochres with various natural gum resins or with animal derived oils/fats (from creatures such as emus and kangaroos) to bind, retain the colour and preserve their ochre paints, contemporary western manufacturers use acrylic compounds, vegetable oils (such as linseed), and gum based water solutions to do exactly the same. Apart from a little more precision in the mix and the processing method, it is not so very different. A traditional ochre painting needs to be extremely carefully stored and handled. 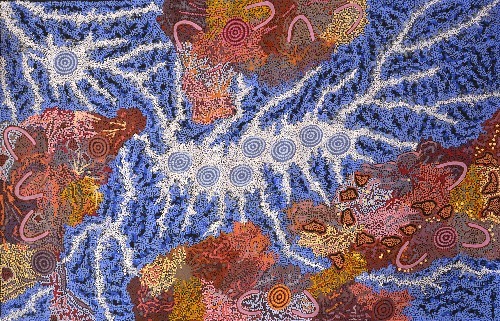 These days, many Indigenous artworks which use traditional ochre pigments, are mixed with a synthetic polymer emulsion, or acrylic compound, to give more durability and strength. They are still far less durable than acrylic paint because they are not as finely ground and therefore at a micro level, they are more crumbly and less 'contained' by the acrylic, but if handled properly, they can last a very long time, especially since the ochre colours have high colourfastness properties. Despite the difficulty in handling and transporting ochre paintings, and the limited palette they provide, they possess a soft, earthy quality which is unique and very attractive, and so they are still the preferred medium of many Indigenous artists.